For our final post, we’ll take a look at our time after heading out of Houn. We left Singkham’s village and headed southwest into Pak Beng. It was another 45 turned 90 minute drive to the quiet river town. Along the way, we were stopped by a group of young cattle herders. We saw a few of them coming up over a hill and then a big group shortly followed. Just as quickly as they'd arrived, they dissappeared into the tall grass on the other side of the road. It was a pretty surreal sight to behold. This was our first look at the cowboys. Houn cowboys heading off into the sunset. We made our way into Pak Beng late that evening. This is a small town that has a steady stream of falang (foreigners) coming through. This is mainly due to it’s boat service to Luang Prabang from Houy Xai, Laos, as well as destinations further up the Mekong and into Thailand. These services include a two day “slow boat” and a 2 hour “fast boat” to Luang Prabang. I’ll let you guess which one is uber dangerous. Pak Beng Port in action. A father and son having a quick chat. This guy wasn't too impressed. Pak Beng doesn't have a lot to do, but it does serve as an excellent place to spend the night and get some food. Sean, Bruce, and I partook of the “free” meal that as included in the price of our room. Out of the three options, we decided that pizza would be the best decision, as it’d been a while since eating western food. We were pretty stoked when we saw three whole pizzas come out of the kitchen. We EACH got a pizza. Sorry, not sure if you caught that. WE EACH HAD OUR OWN PIZZA. Best guesthouse meal ever. The three falang thoroughly enjoyed their pizza. We finished up dinner and headed down to the river bank. At this point, we were pretty used to strange looks but the workers and patient passengers weren’t quite as warm as the new friends we’d made on the journey. After a good night’s sleep we made started the day long journey back to LP. Early on in the trip we crossed over the river via ferry. We were just a few months short of the bridge being completed. Once completed, it will increase the flow of goods into Laos exponentially. This will bring opportunities for growth as well as exploitation in northern Laos. This is a common issue when it comes to progress in our area. Boats for the current ferry service. The ferry makes its last few river crossings in view of it's replacement. We made our way through the mountainous countryside and even made a few stops along the way. The three of us even had a totally unnecessary selfie opportunity. We stopped for some noodle soup in Hongsa and finished our journey that afternoon. Noodle soup shop in Hongsa. This mountain home was being occupied by a grandmother and her grandson when we arrived. As usual, we were greeted with some warm smiles and a friendly hello. We stopped here to take a few shots of the mist covered mountains. Farmhouses dotted the lush landscape. Here's just a few. The four day trip was an eye opening experience. We made a lot of new friends and saw several new doors open for future get-togethers. The trip was very fruitful. With this post, we wanted you to see some of the people and places that we are privileged to come in contact with. 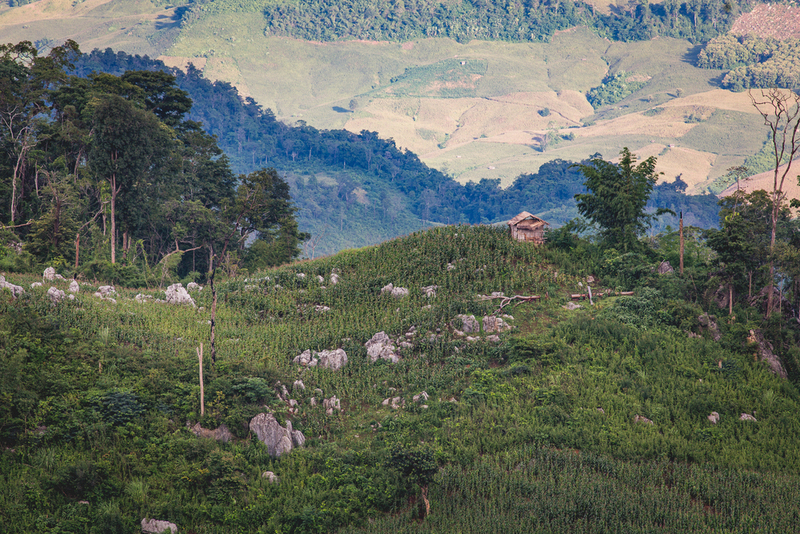 Our hope is that as your eyes have seen the sights of northern Laos, your heart would be opened as well. This nation has been through some dark times, but we believe the future is very bright for Laos. As we wrap up this series, we ask that you’d remember us, the Lao people, and send some good thoughts this way. We hope to see you soon! We've finally made it to Singkham's village! This post is chock full of images so I'm not going to do a lot of talking. I'll give a brief setup and then you can scroll through the day! The day was pretty much spent driving to and from his village along with village tours, reconnecting with old friends, making new ones, and soaking up the rich culture of the Khmu people. We spent the day building relationships and seeing doors open for future trips to our dear friend's home. We, along with the riders of the bike stopped to checkout the river crossing. The current here was incredibly strong. These guys left us and the bike behind. They didn't pack light! One of the "safer" spots on the crossing. One of the many Chinese dam projects that are popping up throughout northern Laos. We reached Houn just in time to check out the town's market and grab some lunch. After we finished lunch, we headed into Ban Na (Singkham's Village). We were met by some kids that I'd befriended a few years prior. The young man on the left with the blue shirt was pictured in a previous post with a huge hunk of banana bread in hand! A group of Houn kids trying to stay dry. Kmhu woman with traditional headwear and pipe. Another Khmu grandmother with a pipe. Our friend and his son. Trying to get the picture. He really wanted his kid's picture taken! Our friend shows us his rat trap. He's hand made dozens of them and has them set up throughout the village. One of the nicest guys we met! This guy had the biggest smile in the village! He flagged me down from across the road for a brief chat. Join us next week for the final installment of To Houn and Back.The journey to Pak Beng and on to Luang Prabang was pretty interesting. My hope is that you will see the beauty of the Lao people and nation as we do. Thanks for walking this journey with us! As we headed down the mountain, we were continually greeted by smiles and looks of surprise. An older woman was chewing on betel nut and as we passed, she looked, smiled, realized we were westerners, and spit it out all over the place! She kept laughing until we were out of sight. As most of our new friends mentioned, we were the first foreigners to ever visit! We came around a curve and experienced one of the best views of the trip. You could see for miles and miles. Cornfields, villages, workhouses, and giant rock formations dotted the landscape. These rock formations looked totally out of place. It was so surreal! Headed down the fast side! More corn than I've ever seen in Lao. I've also never seen corn this high up the mountain. Singkham, Josh, Sean, and Bruce! Farmers use these as a home base for their work in the fields. We stopped at a group of workhouses and spent some time with the family there. We gave out the last of our snacks and talked with them for a while. Singkham was able to really connect with them as he is also Khmu. These villages are just a few hours away from his hometown, but he’d never been this far up the mountain. This was an opportunity for him to explore his home district like never before. Singkham introducing us to the dad of group. The last of our coffee flavored peanutes. Beautiful vistas. Massive rocks everywhere. Workhouse surrounded by the giant rocks. One of the guys we stopped and chatted with on the way down. With the sunlight disappearing, we picked up the pace so that we could get back to Singkham’s village at a decent time. This new route shaved about 2 hours off the trip back to Houn. Approaching the valley. These cornfields were a little more organized than the mountain fields. Headed home after a long day's work. His family had invited us to a meal and celebration/blessing ceremony. I visited a few years ago and both parties were excited for me to be back. They planned a ceremony with the village leaders to bless Bruce, Sean, and I. After a delicious meal, the leaders gathered around us and began to tie strings around our wrists to seal in the Kmhu prayers and blessings. After they were finished, we got to go to each person to pray and bless them in our way. It was a beautiful moment and we believe that our prayers were heard and that things would begin to happen in their lives and village. Singkham's family and village leaders post meal. After the ceremony, we took a quick group shot and headed to Pak Beng to our hotel. This would be our base for the next two days. The “30 minute” trip to Pak Beng took over an hour and we arrived to a closed hotel. After 15 minutes of calling and banging on a few metal roll up doors, an employee emerged from his evening shower to let us in. It was an interesting ending to a perfect day. Stayed tuned for our last 2 days of travel! Thanks for checking out Part II of our “To Houn and Back” series. Last week served as an introduction to the series as well as a short summary of our first day of travel. The second day was quite an adventure! We ended up getting a late start out of Oudomxay because I couldn’t find my loupe (giant eyepiece). I used it during our temple filming the night before and we spent a chunk of the morning retracing our steps. I found it a week later in one of my mic boxes:) After that, we headed to the town of Houn and by the time we reached the district’s main village, it was time for lunch! We ate at one of Singkham’s favorite noodle shops and headed out. Amazing noodles with beef and chicken. This is the "new" road. Took us two and half hours to get to this nice section of freshly "graveled" road. We took off down a narrow dirt road and after about 20 minutes I gave up the wheel to a much better driver in Bruce! With the 4WD engaged, we headed up the mountain. I didn't get any pictures of this sketchy road because I was too focused on my slightly irrational fear of dying. The 45 minute trip turned into a three hour uphill adventure. One of the many villages we passed through en route to Ban Talae. We passed through multiple villages that sat at the top of beautiful tree covered mountains. Each time, a local would tell us that Ban Talae was only 20 minutes away. We quickly realized that nobody had a watch and that it was DEFINITELY not 20 minutes away! Each time we crested another mountain, we failed to see Ban Talae, but were presented with another breathtaking view. The trip took much longer than expected, but it was a journey we’ll never forget. Crazy rock formations with rice homes on the edge. Another "model village" we passed through heading to Ban Talae. Ban Talae is a village of the Khmu ethnic group and was full of beautiful and friendly people. They had never met a westerner and encouraged us to bring our friends and family the next time! They were thrilled that we had come to visit them and even sent some of their young people to guide us around the village and down to the waterfall. Bruce took this shot and you can check out more of Bruce's work Here. Shortly after arriving, Singkham started handing out the snacks! Singkham chatting with our new friends. He's also Khmu! Friendly Kmhu man with a cigarette. This grandmother and her friends helped us clean up after the hike. Our time spent in the village came to an end as the sun started to set. Our new friends told us that we could actually shave few hours off the trip if we headed west down the other side of the mountain rather than returning the way we came. We said goodbye to Ban Talae and headed down the mountain. This leg was just as beautiful as our trip here. With just an 1/8 of a tank of gas left, we were happy about the mostly downhill drive. We'll continue down the mountain and into our friend's village in Part III. Check back soon!!! The start of the road back down the mountain. 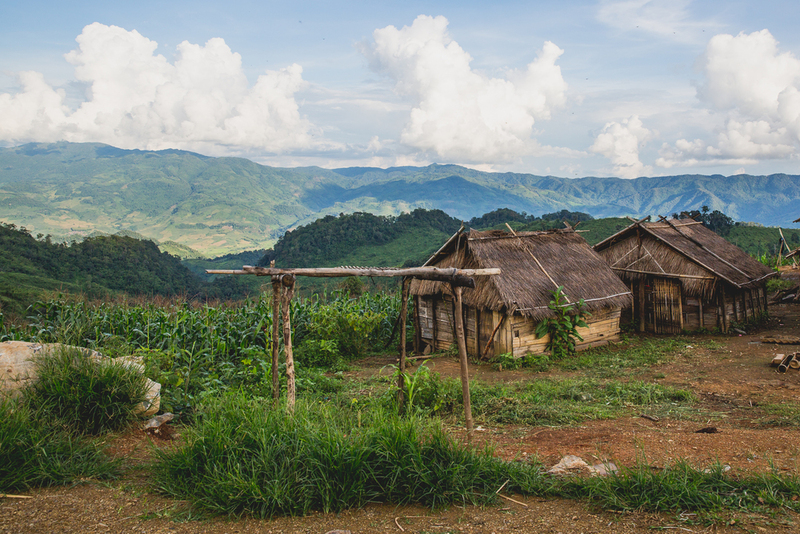 One of my favorite experiences from our first few years in Laos was the trip I made to Houn District. One of our family’s closest friends, Singkham, was born and raised there. Singkham, Thieng, and I had a great time during that first Winter 2012 trip. I’ve been wanting to get back up there for the past few years and we were finally able to make it happen! Last month, along with my two friends and fellow teachers, Sean and Bruce, we made the trip north. Our plan was to meet Singkham in the city of Oudomxay, spend a day, and then head a few hours southwest to his Singkham’s village. Along with getting to spend some quality time with Singkham, who recently moved back to his hometown, we took this opportunity to capture as much of our trip on “film” as possible. With our busy schedules, we typically aren’t able to get away on a trip like this. With one week left of break before school started, this 4 day trip was an excellent opportunity to get as much footage and photography as possible. Our hope was to capture the beauty of Oudomxay Province. I hope that as you read the posts this place and people will capture your heart as it has mine! We’ll be splitting this post up into a few parts so that we can show you rather than just tell you. Roadside spirit house overlooking Oudomxay Province. The drive to Oudomxay Province from Luang Prabang was pretty uneventful. We stopped a few times for some landscape shots and came across a roadside spirit house. The house had several pictures, soda cans, and food wrappers inside. These are typically located at accident sites for people to remember loved ones and to offer food, money, and merit for their journey through the afterlife. After arriving in Oudomxay, we met up with Singkham for lunch and then headed over to Wat Phou Tat for some sunset shots. This mountain top temple overlooks Muang Xay (Oudomxay City) and is one of the highest in all of Laos. We had a chance to sit down with one of the veteran monks there to talk about his story. He allowed us to interview him on camera for a future series on Lao Buddhism. It was great hearing about his journey and connecting with him on a personal level. This man represents thousands of monks in the nation of Laos looking for answers. Our hope is that he and the many like him will find the answer. Iphone shot of the interview. Singkham chatting with our new friend after the interview. Our new friend heading to the temple housing post interview. Our first day ended with the four of us walking around town trying to find a place to eat. We found this little hole in the wall restaurant built into a woman’s home. After ordering, we pulled up trip advisor to find possible locations to visit the next morning. We found out that the restaurant we were eating in was ranked number one in the entire city! The food definitely didn’t disappoint and ambience definitely didn't disappoint! Voted "Best Restaurant in Oudomxay"
The restaurant's owner, resident, and head chef. This wraps up the first day and first part of the blog. I want to leave plenty of room for the pictures coming up. We should be posting the remaining 2-3 parts in the next week or so. 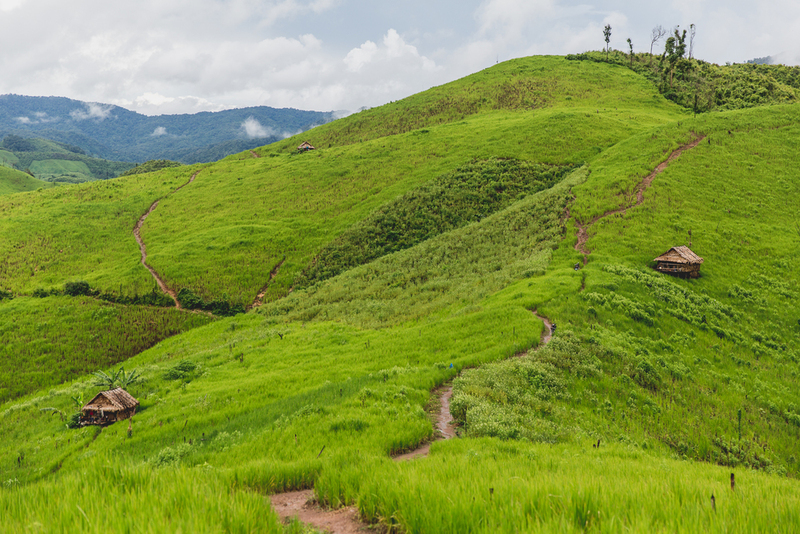 For most of you, this will be your first experience in Northwestern Laos. I promise to pack it full of images from this amazing place. Stay tuned for the rest of To Houn and Back!